The conceptualization to start the Martial Art Academy is the aim to provide, guide and train the kids/ladies/girls and boys to defend themselves at the time of unwanted circumstances we may face in our day today life. Taekwondo in comparison to other similar Martial Arts, is the most popular form now-a-days as its defence & attack techniques are more aggressive and affective. As learning of self defence art has no age bar, the Academy, since its inception, has imparted training to a number of students/ ladies/ girls/kids and also famous personalities/cine & TV artists/models like Sweta Menon, Rajeev Khandelwal, Harshad Chopra, Tanvi Hegde, Bhupendra Singh, Ajay Dixit, Amar Upadhyaya, Manish Goel, etc. ), The Academy has well trained and qualified instructors to impart the training. On qualifying successfully the examinations, held at regular period of time by a candidate, for various rankings/grades, he/she is awarded a belt as well as a certificate issued directly from International Taekwondo Academy, South Korea. Born and brought up in Aligarh, U.P. He is the son of doctor who has been Proctor of Aligarh Muslim University as well as Dean of Medical College, Aligarh. Since his childhood he was very active but unfortunately he got Polio attack which affected his legs. Being a doctor’s son he was put under renowned doctors’ observations for proper medical care but the doctors attending to him were of the opinion that he would not be able to walk properly. But doctors also observed that the child has strong will power and is courageous. As the days, months and years passed he started to show indications of improvement in his limbs which regained his confidence. By the grace of God and with his strong will and courage he became normal and proved wrong to the doctors. He had keen interest in sports/games like other children of his age group, but often he felt weak towards his legs. He started taking part in those games/sports which have more utilization of legs. Fortunately his father was deputed to Iran where he saw movies related to actions, particularly Bruce Lee’s “Enter the Dragon”; “Return of the Dragon”; “Fist of Fury” etc. By seeing these movies his interest was developed to do such type of actions. There was a play ground nearby his house where an Irani instructor started martial art classes. He immediately joined martial art classes over there. When his family came back to India. Feeling the great interest of his sons towards Martial Art his father inquired and requested Mr. Jimmy R. Jagtiani to start and introduce the same in Aligarh, which was started in the year 1978. Taekwondo was one of the game/sport of his choice as this game/sport is based on kicks and punches. So he decided to select only Taekwondo and pay his full attention on it. Due to his strong will power, keen interest and courage he made new records in Taekwondo, won several trophies in District/State/National level tournaments/championships. He got accolades & appreciations from a number of dignitaries. 1. Post Graduation in Sociology from A.M.U. U.P. He has trained a number of N.C.C. cadets (Boys and Girls) in camps at N.C.C. HQs as well as in schools/University premises in U.P. Imparted Taekwondo Training in Delhi Public School (DPS) at Delhi. In October 2000 he was awarded as best demonstrator in martial art skills at Mohali Sports Stadium. He had also been on top position in taekwondo skill performance at Annual Training Camp N.C.C. Lucknow U.P. 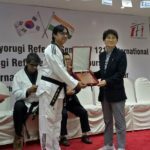 He has created a landmark in demonstrating taekwondo skills and promoting the self-defence art all over India especially in U.P., Delhi, Chandigarh, Secunderabad (U.P), Hyderabad, Lansdown (Garhwal) etc. 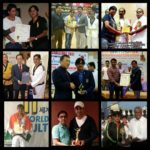 more than 120 black belts holders in India. He has been organizing Taekwondo championships/events since 1988. 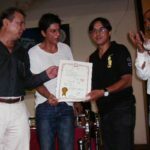 In the year 2012 “Taekwondo Challenge-2012” was organized by the Academy in where the chief guests awarded certificates of ‘outstanding achievement in Taekwondo’ to Ms Neetu Chandra, Master Pervez Khan & Master Mahendra Mohan. Ms Neetu Chandra was also the guest-of-honor and awarded the medal to the winners in which celebrities like Amar Upadhyay was awarded 1st DAN certificate.